Recently Xiaomi released the new Redmi Note in the indian market and most o the users already bought the same and enjoying the new features of the note. The device comes with lots of the new features and with the MIUI ROM, If you recently bought the device and looking for the way to root your device. Here is the complete Guide to Root and Unroot your Redmi Note 3G version. This guide is only for the Xiaomi Redmi Note 3G users, don’t try this method on any of other Xiaomi device. After rooting your device you can easily install the custom recovery and lots of rooted application, check out our guide here to know more about the benefits of the rooting. Before following this guide do take the full backup of you device and read all the instruction very carefully and follow them step by step. Check the model number of device and make sure you have correct model or device for which the guide is prepared. 1. 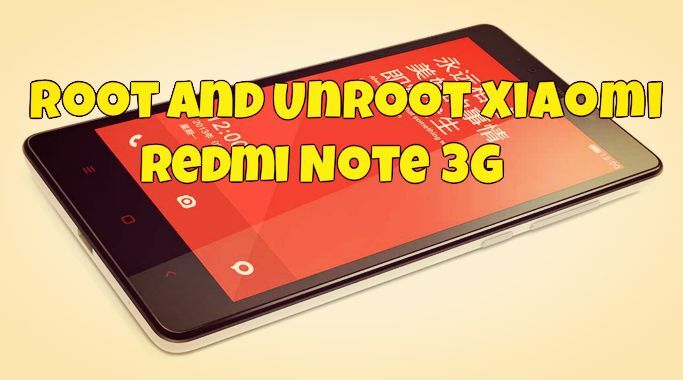 Download the root.zip file for Redmi Note 3G here on your desktop and don’t extract the folder. 2. Put these files on in the SD card of your Note. – Not inside other folders. 3. Now open Updater app on your Note, click menu – select “select update package option”. Then select the “root.zip” that you downloaded on step 1 and update. Now your phone will ask you to reboot. Select reboot now. 4. Reboot your system now. Go to Security app – Permissions – Root permission – Turn on. You have root access now. Now enjoy your rooted Redmi Note 3G . In future if you want to unroot your device, then follow the below mention steps. 1. Go to Security app – Permissions – Root permission – Turn it off. 2. Download the unroot.zip file here. 3. Connect your phone to the pc and move the file on your phone SD card. 4. Now open Updater app on your Red mi Note, click menu – select “select update package option”. Then select the “unroot.zip” that you downloaded on step 2 and update. Now your phone will ask you to reboot. Select reboot now. Voila! Your phone is unrooted again. For more tips and tricks check out our Xiaomi section here. please root xiaomi note 4g.